Andrews Automation were invited to offer a solution to a highly manual operation involving parts bins return to suppliers. Engine parts from suppliers are delivered to the engine assembly line contained in a variety of plastic tote bins and standing on wooden CHEP style UK pallets. Once parts are removed the bins have to be packed and returned to the respective supplier for reuse. Tote bins were stacked onto pallets and manually strapped to retain them in transit. This was a highly manual process. Andrews offered a fully automatic solution using a STRAPEX automatic strap application machine and a powered conveyor system. Andrews Automation handled the full turnkey project. Pallets are loaded by fork truck directly from the production lines. Infeed accumulation is provided infeeding to the strapping machine. The stap application process takes approximately 20 seconds per strap (typically 2 are applied to each pallet). 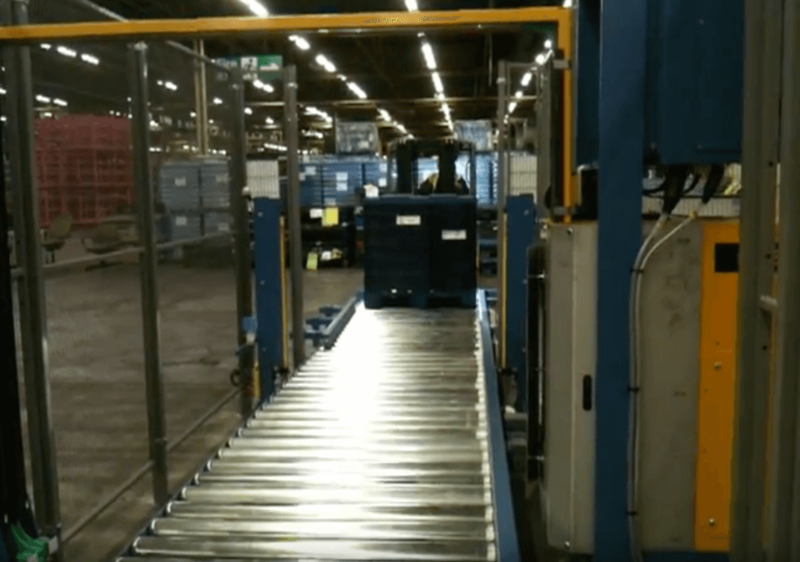 Accumulation of finished pallets in pairs minimises outfeed conveyor equipment whilst maximising pallet accumulation prior to loading onto a lorry ready for delivery back to suppliers.